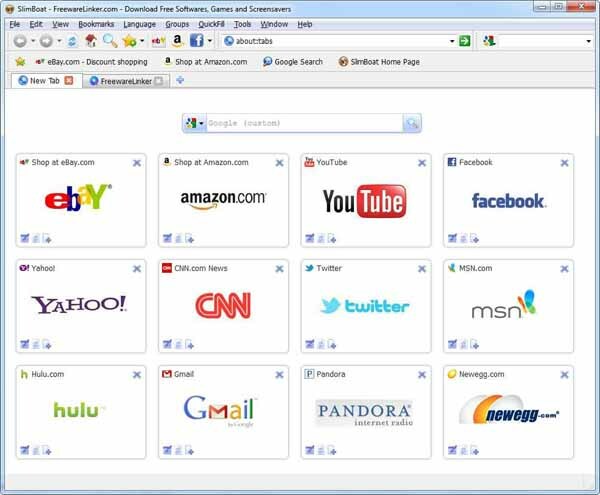 Free download Portable SlimBoat Latest Version.SlimBoat is a free web browser that is fast, secure and efficient. It is fast to start up and fast to open your favorite web sites. SlimBoat helps you surf the internet safely and securely by incorporating multiple layers of protection measures. SlimBoat also includes tons of powerful functions and flexible options so that you can reach your favorite destination on Internet in the most convenient way while avoiding unnecessary distractions and annoyances. SlimBoat is based on the high-performance open source webkit rendering engine. It runs across different platforms including Windows, Mac and Linux. Slimjet Web Browser is released under the freeware license. It is free both for personal use and commerical use. It is free to be distributed over the internet and/or through offline distribution channels as long as it is kept in its original form without any change.